Published on : April 27, 2012 Published by : Gil Riego Jr.
Lalo Franco, director of the cultural and historical preservation department of the Santa Rosa Rancharia Tachi Yokut tribe, shares the story of one of the baskets being repatriated that was made by his grandmother, Maggie Icho, who was well known for making ceremonial baskets. Photo by Gil Riego Jr.
Tribes from Santa Rosa and Lake Isabella gathered at SF State for a historic moment in modern Native American history. In accordance of the Native American Graves Protection and Repatriation Act, today’s ceremony marks the first time in California history that ceremonial baskets were returned to their original tribes and the first time in U.S. history that a non-nationally recognized tribe has been given repatriations. Representatives of the Tubatulabal tribe from Kern River Valley and the Santa Rosa Tancharia Tachi Yokut tribe gathered in the Science Building alongside Jeffrey Fentress and Kathy Wallace of SF State’s Native American Graves Protection and Repartition Program and other members of the archeology department for the historic occasion. 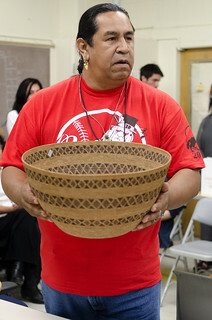 Tears began to well in the eyes of those present as Lalo Franco, director of the cultural and historical preservation department of the Tachi Yokut tribe, told the story of one of the baskets being returned. Multiple ceremonial baskets were returned to both tribes, including one made by Franco’s grandmother. Before the signing of the forms, both tribes sung prayers to commemorate the occasion in their native languages. “This law (NAGPRA) is really important to us,” said Franco. He explained how these found artifacts and research collected, including bones of exhumed burial grounds, are now officially recognized as human beings. The repatriation of these baskets came at a fortunate time for the Tubatulabal tribe. NAGPRA’s origins can be traced back to when Abraham Lincoln signed the Morrill Land-Grant Acts, which gave land to several universities according to Elizabeth Parent, retired SF State professor of American Indian studies. In previous years, SF State has returned remains of tribes in the Central Valley, and according to Fentress, they will continue doing so for as long as they can.